Blackjack is, and always has been, a real gentlemen’s( and gentlewoman’s game). In 2017 Blackjack is easily accessible at any online casino. A classic casino game brought to the comfort of your own home! As this is such a hugely popular game, Canadacasino.reviews has put together this guide offering basic guidelines for prospective Blackjack players. Upon entering a real casino, you’ll notice that Blackjack table takes centre stage in the gaming room. Usually the table is full, and surrounded by many spectators. This naturally creates a special ambiance and gets you in the mood for some playing. However, if you choose to play Blackjack at online casino, you get to avoid the crowds and there’s definitely no need to wait for your turn to be at the table! Blackjack is not a difficult game, and it’s definitely an enjoyable one- we highly recommend you trying it out! Playing Blackjack requires some skill, but once you are familiar with the rules, and you get a little experience, you will notice that it is a rather straightforward game. 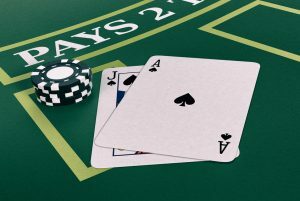 Your goal in Blackjack is to beat the dealer by getting 21 points or getting as close to 21 as possible. The rules of the game give you three options to reach this goal. The first one is by letting the dealer draw cards until they exceed 21. The second one is by getting a final total that is higher than the dealer, without exceeding 21. And the third one is by getting a total of 21 points with your first two cards. When playing Blackjack online, you can choose to play with or without a live dealer. You can choose the version where you play against the dealer (computer) and see just the cards on your screen. This might be a good way to improve your Blackjack skills and come up with your personal gaming strategy. After some learning by doing, we at Online Casinos Canada recommend that you step up your game by joining a Blackjack table with a live dealer. A big part of Blackjack’s charm comes from playing against the other players. At live dealer online Blackjack you get to see the moves that other players make, plus you can interact with the dealer, and see them react to your requests. Whether you are using your phone or computer, live dealer games work as long as your internet connection is fast enough. The streaming of the game in real time is done with a video interface software. As you can see everything happening at the table, including the cards dealt, you can be sure that nobody will be pulling your leg. Blackjack is a game that makes you experience many emotions; among these the thrill of beating the dealer, the excitement at the table just before the next card is dealt and the frustration of not quite getting the hand you wished for. The secret to Blackjack success is holding your nerve. A real gentleman, and a real gentlewoman will accept the dealt hands as they come, and learn from their mistakes. You cannot always have the luck on your side, and you might just be sharing a table with a player who is an unofficial card counting champion. Sometimes you will lose, but sometimes you will also win, and the more cool you remain, the more often you will win. Learn the basic Blackjack rules, practice the game, and enjoy your experience!